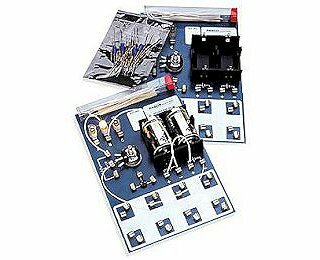 These simple kits provide a strong foundation for future studies in electronics. They take students from the basics of Ohm’s Law through simple series and parallel circuit analysis, and into some elementary aspects of electronics where they will build circuits using capacitors, transistors and diodes. One kit per two students is recommended, giving each student his or her own circuit board. Unique Spring Connectors: Twist them, bend them, push on them: no damage done. These connectors will still hold components and wires securely. Circuit Experiment Board: With this board and the included components, students can build a variety of basic circuits, from resistors in series and parallel, to a simple amplifier. Low Voltage: Two D batteries provide all the power needed (batteries not included). Manual provided with Teacher’s Guide and Sample Data. Each circuit board contains the following materials. Replacement parts for the Basic Electricity Lab (EM-8622).